Fiserv, a leading global provider of information management and electronic commerce systems for the financial services industry, was looking for a fun way to connect with prospects and introduce the many services that Fiserv provides. Knowing that client decision makers are exposed to a constant influx of communications, Fiserv needed to cut through the clutter and find an interesting way to grow the relationship. Fiserv partnered with d.trio to develop and send out a quarterly direct mail campaign using high-end candy jars filled with candy to top prospects to warm them up to a call from a Fiserv sales executive. The first candy jar promotion included a targeted message of “sweet ideas”, introducing their Fiserv representative and informing them of future communications. As a follow up to the original candy jar, a quarterly mailing was sent containing candy to re-fill their jar. 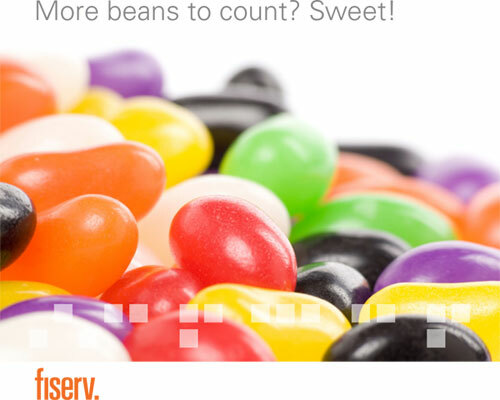 Following the theme, “Another Sweet Idea from Fiserv”, a fresh supply of candy and information about one of Fiserv services such as ACCEL/Exchange Network, CardVision, and Risk Management were sent to the same prospects. Each message correlated with the selection of candy, creating a compelling touch-point. For example, M&Ms with eyeballs promoted credit card fraud protection and PayDay® candy bars offered clients information on a pre-paid payday debit card program. Fiserv was able to achieve the goal of creating a renewed awareness of its brand and the services it offers to its clients. Calls from their sales representatives were warmly received by the targeted prospects – proving candy can pave the way to a sweet relationship.